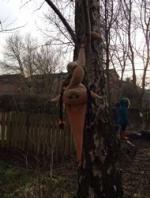 Park Grove Primary Academy » It’s been so cold…. …but it hasn’t stopped us from exploring outside. We were delighted to see that the shoots we’d spotted in the wildlife area last week have grown. We think they’re daffodils! We were so busy making badges this week but we stopped to listen to a bird. It had a beautiful sound. We couldn’t see it but we stood still to listen. It was very special. Sage was out there but she was upside down in a tree. She looked very funny!